Discription: 58:00 mins, handmade deluxe envelope. Dragos Tara has realized different projects: Performance for musiciens, dancers et electronics in the former jails of Vevey (2005) ; Jeu : duel musical pour double-quartet (2004), solo concerts and a doublebass quartet.He has also written music for various ensembles: Ensemble Vortex, compagnie CH.AU, íllorkestra, Bolouris 5tet, Ostermundigen symphonic Orchestra. Piero SK is a personage born approximately 10 years ago, on a table of writing. He is an autodidact and work in theatre, writing and music. He collaborated in particular with Monsieur Jean, Noël Akchoté, Saadet Türköz, Jacques Demierre, Jacques Roman, Wilbert de Joode, Obaké, AbSTRAL compost, la Gale, Vernacular, Jeudi, Rue du Nord. Its biography is variable, its room is populated by shadows. This Swiss outfit fuse laptop noise and found objects with free jazz percussion. Sounding somewhere between Jooklo and Usurper, they muster a noisescape of rambling extremities. 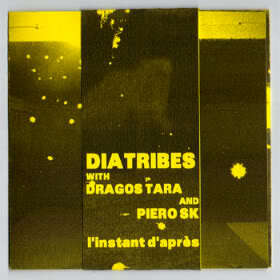 On this CD-R double bassist, Dragos Tara and the incredible saxophonist, Piero SK, join them. The album was recorded in spring this year and captures a fresh landscape of discord and insanity. Throughout proceedings, the rambling is often pivoted with a stronghold forged by SK's devastatingly corrupt and direct soprano sax. The improvised element gives an intimate and live feel, to the home-listening experience. The electricity thrust upon the eardrum tingles the dormant into motion. ‘La démocratie reste un système bourgeois' is the most profound piece on this record. Showcasing the musicians through unity and full-frontal solos; this is 13minutes of improvised jazz at its best. Creaking soprano sax and electronics collide over a rolling tide of percussion. After 5minutes all artists excel into a ferocious battle finally giving way to a laptop and drum tempest. To mark a departure into reflective fields, SK is given the stand in an inspired solo that trudges with the pace of the heavy breathed session of Anthony Braxton on his contra bass sax. A deep, pained melody is strutted over an ever-pounding 4/4 drum pattern. The stop start of SK's paying accompanied with touches of eastern European gypsy and Moorish patterns, which allude to visions of seedy bathhouses in Budapest. This is music that is as visual as it is aurally stimulating. Finally, as the other players enter the cacophony, a rich canvas of twisting sounds fornicate in hell - a hell from the mind of Bosch.